The 15 Second Kitchen is a series of bite sized recipe walkthroughs, developed for Hidden Valley to showcase how ranch dressing can be a core ingredient—not just a condiment—in any type of dish. Made to be easily sharable, the video series has been featured across all Hidden Valley social channels—Facebook, Twitter, Pinterest, and Instagram—as well as on hiddenvalley.com alongside their corresponding recipes. 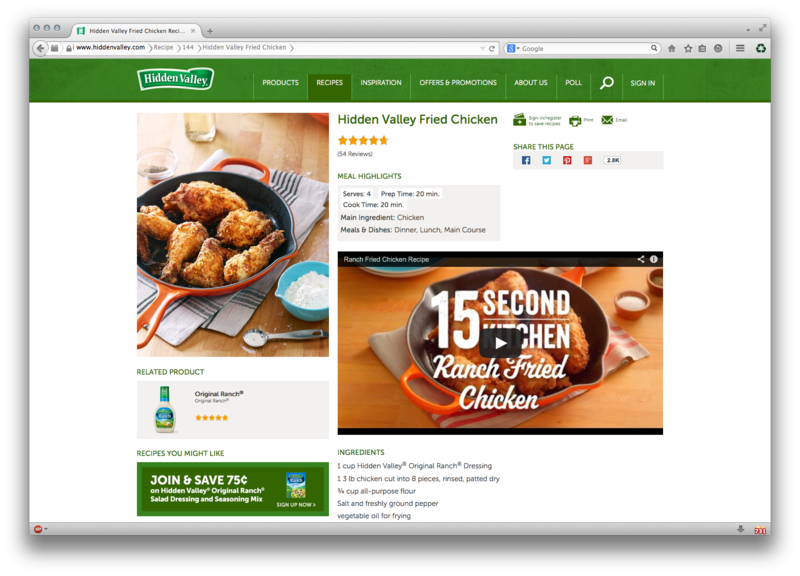 Within four months of making their debut on the Hidden Valley website, the 15 Second Kitchen series was responsible for over 700 hours of additional time visitors spent while browsing recipes on the site.